Cloud computing or “Cloud” as its commonly called simply refers to storing and accessing your data and programs over the internet instead of your device’s internal storage resources or a local server. The cloud does not have a dedicated network attached storage (NAS) hardware or server in residence. One of the biggest challenges faced by app developers, standalone or enterprise, is to build apps that can run efficiently on different mobile devices and different platforms. Developing newer versions of your app for different operating systems and different models of the device simply does not make sense given the huge cost and effort it entails. What makes sense is to host all apps and data to a server running on a mobile cloud so that users can access them anytime, anywhere. Which is the best Cloud provider for your enterprise: AWS or Azure? The cloud computing market is highly competitive. Although in its nascent stage, cloud computing is a major disruption in the IT field and that is what makes it so lucrative for the cloud providers. Amazon’s AWS is the frontrunner in this market. It has more than 10 times the compute capacity as the combined capacity of its 14 closest rivals including Azure. But this does not spell bad news for Azure. Azure is fast catching up as AWS’s closest competitor with its networking capabilities almost twice as of its nearest rival. Cloud providers are mainly assessed on the basis of parameters such as compute, storage, network, database and pricing. 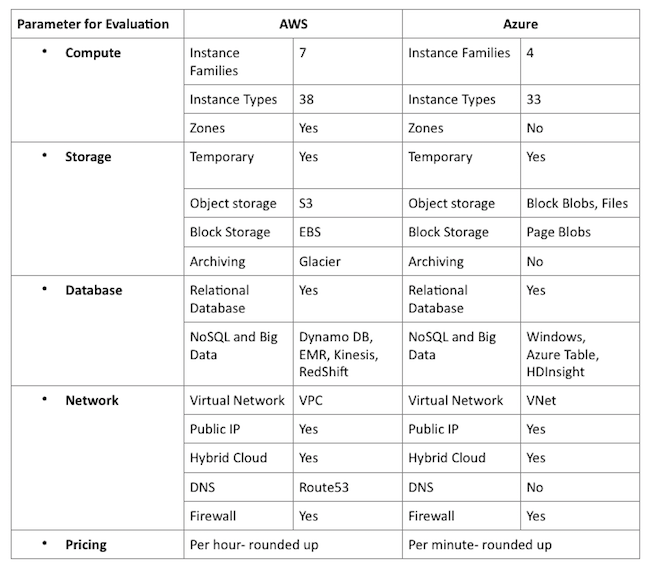 Let us see how Azure and AWS stand these tests. AWS provides temporary storage that is allocated once an instance is started and is destroyed when the instance terminates. It provides Block storage which is the same as hard disk as it can be attached to any instance or can be kept separate. AWS also offers Object storage with S3 service and archiving services with Glacier. These services are not available in Azure. Amazon’s virtual Private Clouds VPC and Azure’s Virtual Network VNet allow users to group Virtual Machines VM into isolated networks in the cloud. Users can specify network topology; create subnets, route tables, private IP address ranges and network gateways. AWS is unique in providing Route 53, a DNS web service. AWS mainly offers EC2 instances which can be customized according to your enterprise. Azure’s offering is centered on its VMs with other tools like cloud services and Resource Manager to help deploy applications on the cloud. Azure’s inter compatibility with Hyper-V has advantages for those running Microsoft VM in their data centre and for those using the Azure Stack private cloud system. Azure and AWS support relational and NoSQL database and Big Data through Windows Azure Table and HDInsight. AWS charges customers by rounding up the number of hours used so the minimum use is of 1 hour. AWS instances can be purchased using one of its 3 models- On demand (Where you pay for your actual use with no upfront cost): Reserved (Where customers reserves instances for 1 or 3 years with an upfront cost based on use)and; Spot(Where customers bid for the extra capacity available on the cloud). Azure charges customers by rounding up the number of minutes used for on demand. It also offers short-term packages with discounts. Choice of cloud computing providers is entirely the choice of the enterprise. With vendors vying for consumers’ attention, consumers stand to gain with all options. 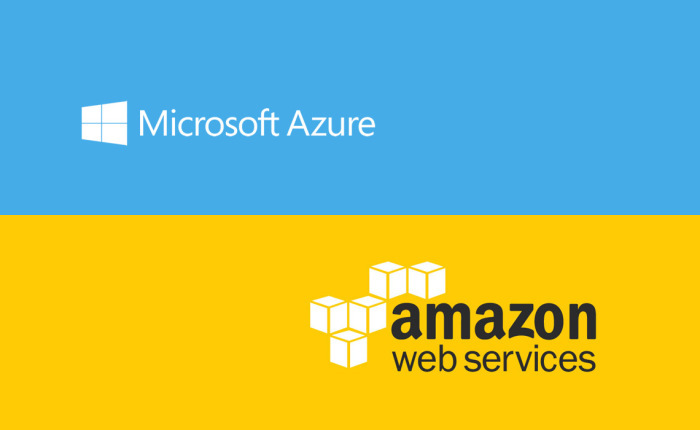 Azure is fast catching up as AWS’s closest competitor with its networking capabilities almost twice as of its nearest rival.